In a sealable container, whisk together all the ingredients for the marinade. Season with salt and freshly ground black pepper. Add the prawns and toss to coat. Cover and leave to marinate in the fridge for one hour. 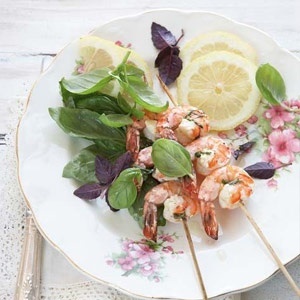 Thread the prawns onto skewers and grill under a hot grill or over hot coals for two to three minutes a side. The prawn tails should be bright pink and the meat opaque.